What are the benefits of our consultancy and training on the Occupational, Health and Safety Management System? The implementation of proper Occupational Health and Safety Management System includes documentation of all procedures and processes, including operational and documentation control, establishment of emergency procedures and responses, and communication with employees to ensure that they can competently implement the necessary processes and record results. The Occupational, Health and Safety Management System - ISO 45001:2018 Certification can be a very effective tool to identify cost savings opportunities for organizations. Few organizations can falter in its planning, lack senior management's commitment and poor understanding of how it should be implemented. And hence, those organizations find the task of managing OH&S system challenging. Establish an OH&S management system to eliminate or minimize risk to employees, and hence motivate employees regarding occupational health and safety. Reduction in possibilities of accidents and incidents. Reduced material and man-days loss due to accidents and production breakdowns. Improved image and competitive ability by way of sustained OH&S performance. We offer ISO 45001:2018 Awareness and Auditor Training presentation kit which is prepared by a team of highly qualified management professionals and experienced consultants. This OH&S training presentation slides are extremely useful while conducting corporate training on OH&S system auditing within the organization or any work area. Our clients from the USA as well as from other parts of the globe have already used our ISO 45001 training ppt presentations for the implementation of ISO 45001 and providing training to their employees. Our PowerPoint slides are in editable format. This OH&S ppt presentation kit for occupational, health and safety management systems is pleasingly designed and presented to establish a much better understanding of occupational, health and safety system. What Does ISO 45001:2018 Training Presentation Kit Offer? OH&S Awareness and Auditor Training Presentation Kit i.e. ISO 45001 training kit contains more than 340 slides of presentation and handouts of literature for participants. These handouts aid further learning to the participants. This part comprises more than 340 slides, to get the message over and establish a much better OH&S understanding. It also describes how to tackle ISO 45001:2018 certification and drills down into all the relevant topics in depth. This part includes write-up in MS-Word for ready-reference, better understanding and easy reading. Department-wise,a question bank of over 800 questions is also provided (based on ISO 45001:2018 certification requirements). You can customize this question bank to make your own internal audit checklist. Following topics are covered in the handouts. Introduction to ISO 45001 system. ISO 45001 Terms and Definitions. Summary of ISO 45001:2018 requirements. Steps to an ISO 45001 installation. Why Purchase our Training Presentation Kit? Our ISO 45001:2018 training kit is written in easy to understand language. The soft copy of presentation and hand-outs are given in editable formats. One can edit it as per their own requirements. The handouts are written in MS-Word 2007 and Presentation Slides are prepared in PowerPoint 2007. The entire training kit has been developed under the guidance of experienced experts and globally proven consultants. The kit is user-friendly and easy to learn. Moreover, one can add company logo as well as voiceover for the training of the staff. Because of completely editable presentation, this kit is time-saving and cost-saving to create a new presentation for own use. Many companies are implementing ISO 45001:2018 system and getting benefits of 45001:2018 Certification as an improved OH&S system in day-to-day life. In the preparation of training kits, the contents has been verified and evaluated at various levels of our team. More than 1000 hours are spent in the preparation of this training presentation kit. Our training kit is prepared by a globally proven team of leading consultant. On successful completion of secured purchase, we provide a username and password to download the product from our FTP server. We provide instant online delivery of our products to the users by sending username and password by e-mail. 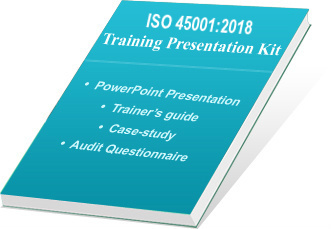 This ISO 45001 Awareness and Auditor Training Presentation Kit is available at a very compatible rate and any one can purchase it with secured online transaction via Paypal.com. We ship our products worldwide and they are used in more than 65 countries.